2009-3 (7-0): One; Apponaug Cove, Warwick; 11 Jan 2009 to 2 Feb 2009; Jan St. Jean (I), Mark Lynch (R), Sheila Lynch (P). This male Tufted Duck was found in January by Jan St. Jean. 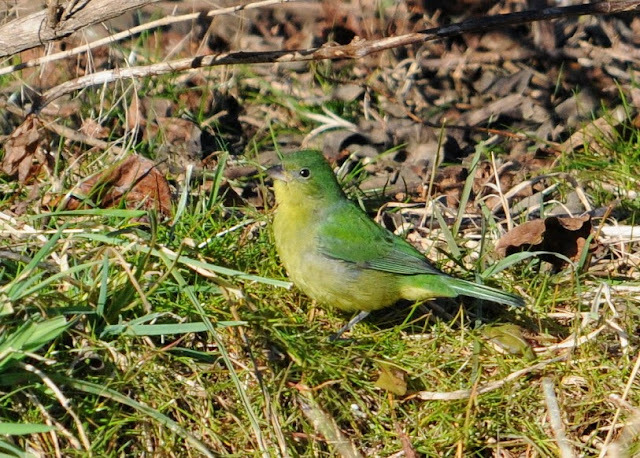 In February, Mark Lynch and Sheila Carroll located and photographed the bird. Mark and Sheila submitted a written report that included details of a hybrid male Tufted Duck seen in the cove as well. Unfortunately this hybrid was too distant to be photographed. 2009-1 (7-0): Five; Golf Course, Harrison Road, Newport; 18 Jan 2009; Jeanette and Derek Lovitch (I,R,P). Jeannette and Derek Lovitch, from Maine, picked out five Cackling Geese on the snow-covered golf course along with approximately 1000 Canada Geese, and one adult “Blue” Snow Goose. They then sent in their written report and photographs providing documentation of the sighting. 2009-2 (7-0): One; 6 miles S of Block Island; 28 Mar 2009; Jan St. Jean (I), Phil Rusch (R). Several birders were aboard one of the Frances Fleet cod-fishing boats out of Galilee. As the boat was moving slowly to a new location they passed this Atlantic Puffin at a distance of only about 75 feet. All birders aboard immediately recognized it as a puffin. Although there were no photographs, Phil Rusch submitted a written report along with sketches that provided the record of the sighting. 2009-8 (7-0): Four; SW corner of Block Island; 30 Apr 2009 to 6 May 2009; Tom Magarian (I,R), Dan Finizia (P). Tom Magarian found and reported these four Pacific Loons off of the southwest corner of Block Island. Several days later Dan Finizia and Sue Talbot re-located these birds in the same area. Dan was able to get distant photos that confirm the record. 2009-4 (7-0): One; Fort Getty Road, Jamestown; 3-5 May 2009; Dan Finizia (I,R,P), Sue Talbot (I,R,P). Dan Finizia and Sue Talbot found and photographed this immature White-faced Ibis in the field with 22 Glossy Ibis and 3 Cattle Egrets at the corner of Fort Getty and Beavertail Roads in Jamestown. 2009-5 (6-1): One; North End, Block Island; 8 Jul 2009; Tom Magarian (I,R). This bird was initially found in the rip at the north end of Block Island in a feeding flock of gulls, terns, Cory's Shearwaters, and Wilson's Storm-Petrels. The bird eventually came in and sat on the beach at the point. This report was of a bird seen head-on for a short duration. While the details submitted were consistent with Arctic Tern, the limited view and the lack of confirming details were not sufficient to rule out more common tern species. 2009-7 (7-0): One; Mud Hole (pelagic), 4 Aug 2009, Scott Tsagarakis (I), Doug Wilson (I), Carlos Pedro (P). There were 17 birders on a pelagic trip out of Galilee. While near Mud Hole, Scott Tsagarakis and Doug Wilson observed this skua harassing gulls off in the distance. The bird initially flew towards the boat but then at about 100 meters turned away. Carlos Pedro submitted a photo of the distant bird. 2009-9 (7-0): Twenty-six; S of Block Island; 19 Aug 2009; Doug Wilson (R), Paul L’Etoile (P). There were approximately 40 birders on a dedicated pelagic trip out to the continental shelf about 70 miles south of Block Island. Throughout the day Audubon’s Shearwaters were observed flying, on the water, alone, in small groups, and at various distances. Paul L’Etoile submitted photographs showing different views of one of the Audubon’s Shearwaters in flight. 2009-10 (7-0): One; North End, Block Island’ 25 Sep 2009 to 4 Oct 2009; Scott Tsagarakis (I), Doug Wilson (R,P). This Western Kingbird was originally found by Scott Tsagarakis and others at the North end of Block Island. It was seen by several other birders through the following week. During that week there were reports that there were up to two birds in the area. 2009-16 (5-1): One; Wakefield; 17-Oct to 20-Dec-2009; Geoff Dennis (P). This Rufous Hummingbird stayed for a couple of months in the same Wakefield yard that hosted a Rufous/Allen's for a month in 2005. 2009-15 (7-0): Three +; (West Beach Road, Dorrie’s Cove, Grace’s Cove), Block Island; 12-14 Nov 2009; Robert Emerson (I,R), Patricia Lindsay (I), Shaibal Mitra (I,R). On November 12, Bob Emerson located a Pacific Loon while viewing the ocean from the dump at the end of West Side Road. A northeast storm was brewing, and no photographs were recorded. Farther south in the aftermath of the storm on November 14, Patricia Lindsay and Shai Mitra reported 2 Pacific Loons from Dorrie’s Cove, and 1 from Grace’s Cove. Although no photographs were obtained, two detailed written reports were submitted. 2009-11 (6-1): One, Sachuest Marsh, Middletown; 1-8 Dec 2009; Rey Larsen (I,R,P). This dowitcher was found and photographed by Rey Larsen at at the Sachuest Saltmarsh. The bird stayed in the area for a week and was subsequently seen by many birders. While the report was accepted as a Long-billed Dowitcher based on the photos, there were no accompanying reports of the bird calling. 2009-12 (7-0): One; Matunuck, South Kingstown; 12-18 Dec 2009; (Linda Gardrel, Bob Jones, Kathy Patric, and Chris Sidler (I)), Paul L’Etoile (P), Sue Talbot (P), Dan Finizia (P). Four birders, Linda Gardrel, Bob Jones, Kathy Patric, and Chris Sidler shared the credit for finding this bird and immediately getting the word out. Other birders were able to able to locate this bird along Moonstone Beach Road between Card's Pond Road and Matunuck Schoolhouse Road. The bird was reported again the following day, and several days later on the 18th. 2009-13 (7-0): One; Sakonnet Point, Little Compton; 19-23 Dec 2009; Bob Emerson (I), Ed Stedman (I), Geoff Dennis (P). Bob Emerson and Ed Stedman found this Le Conte’s Sparrow on private property while covering the Sakonnet sector as part of the Newport – Westport Christmas Count. A significant snowstorm hit the next day, but the following day Bob returned with Geoff Dennis and found the bird. Geoff was able to get photos. Bob obtained additional permission to visit the location, and during the next two days he led other birders to observe the bird as well. 2009-14 (7-0): One; Route 77, Tiverton; 19 Dec 2009, Carlos Pedro (I,R,P). This Sandhill Crane was discovered and photographed along Route 77 in Tiverton by Carlos Pedro. The bird was found during the Newport/Westport Christmas Bird Count.